Evan Coulson, Bro professor of sustainable regional development, tells a story worth remembering. He was managing the rock climbing and rappelling site at Bob’s Rock in the Chequamegon-Nicolet Forest this past summer for a group of Chicago teens. 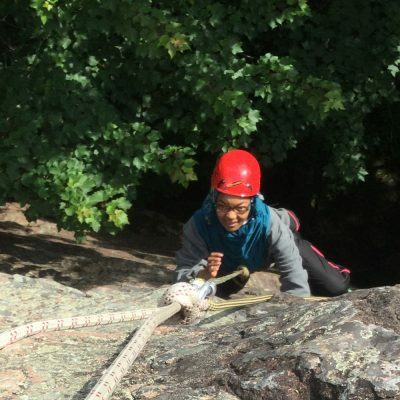 This outing was part of a collaboration between the Sigurd Olson Environmental Institute and The Center for Conservation Leadership, a nonprofit in Chicago with a mission to get teens of all backgrounds engaged in the outdoors and conservation. For ten days, students hiked, camped, volunteered, climbed, and connected to the region and one another. Part way through the program, a teen girl hiked to the top of Bob’s Rock with her group of peers for their turn at the rappelling station but then decided last minute not to descend. She was afraid of heights. “I invited her to spend some time at the top of the cliff with me,” Coulson said. She agreed. Coulson anchored her in and she sat several feet from the edge as her peers received their briefing, went through all of their safety checks, and then, one-by-one descended. Eventually, she was at the very end of her personal anchor line with her feet dangling over the edge of the cliff—success! Coulson expected the teen would eventually take her turn. She didn’t. Instead, she continued to watch, her legs continuing to dangle. Then, after nearly two hours of her sitting at the edge, she turned to Coulson, with red eyes and tears streaming down her cheeks. “This was not the face I was expecting to see and I worried that she had been gripped with fear the entire time,” Coulson said. What she said next surprised Coulson. “I didn’t know there could be this many trees in the whole entire world,” she said. Coulson and the girl turned their eyes back to the line of exposed ridges along the sprawling view of the Penokee Mountains. “I want to learn even more and work even harder to help people protect them,” she concluded.